The E90 camera is a wide-angle, high resolution, gimbal stabilized imaging system perfectly suited for use in applications that require high quality photo and video. The E90 utilizes a 20 MP 1-inch sensor and the latest H2 high speed image processing chip. The E90 utilizes a high aperture 1 inch CMOS imager that is capable of capturing still images with 20 megapixel resolution. The sensor provides exceptional dynamic range and improved signal-to-noise ratio. The E90's 23 mm lens equivalent provides wide angle view via an all glass lens system with low distortion and minimal lens dispersion. The E90 comes with a lens adapter ring threaded to fit 40.5mm standard ND filters for flexibility and convenience. A 3-axis stabilized gimbal with high precision provides a steady platform for the E90 camera. With a precision of +/- 0.02°, E90 shots are rock-solid whether loitering or flying full throttle. 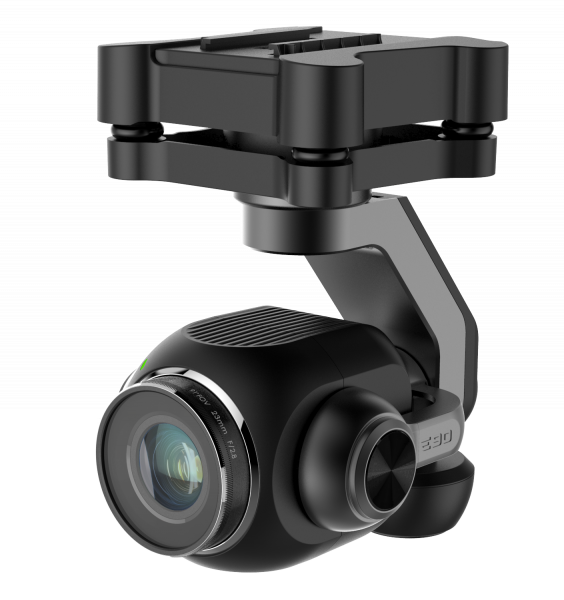 The E90 gimbal is capable of unlimited 360 yaw axis rotation. This unique feature, when combined with the H520 retractable landing gear, provides the operator with full 360 unobstructed camera view and the ability to continuously pan the camera without yawing the airframe. The E90 is hot-swap capable which minimizes down time and improves productivity. The E90 camera-gimbal combination may be swapped for an E50 or CGOET camera-gimbal combo without power cycling the airframe. The quick release and lock mechanism of the gimbal and airframe mounting system enables fast and efficient exchange of cameras. User will appreciate the dramatic aerial shots afforded by the E90’s high frame rate and accurate color. In addition, the E90 is ideal for commercial applications such as accident recreation, search and rescue operations, and for 3D mapping/modeling. The H520 is the perfect partner for the E90. The hexacopter is appropriate wherever long flight times and tried-and-tested technology are required in an all-in-one package. The six rotor safety as well as the waypoint technology and a lot of other features make the H520 and the E90 camera ideal for both, industrial and private applications.